On March 23, the Associated Press reported that three Texas healthcare providers had applied for tens of millions of dollars of federal Title X funding from the Department of Health and Human Services. Like other organizations that receive such funding, the centers, which are affiliated with Obria Medical Clinics, make family-planning services available to low-income patients either for free or at a very low cost. They retain nurse practitioners and OB/GYNs, provide counseling, test for STIs, and provide prenatal care. Using a recently launched app, young people can even chat with an Obria provider over video, the logic being that people should trust and be loyal to the reproductive clinic where they receive care. Patients are encouraged to visit Obria for their annual “well-women” exam. Originally a more traditional, explicitly religious “crisis pregnancy center,” Obria has rebranded over the last few years in an explicit attempt to replace Planned Parenthood entirely. And, as it knows, that isn’t possible using individual donations alone—by selectively offering medical services and partnering with sympathetic healthcare providers, this new wave of religiously motivated healthcare centers are more likely to be eligible for federal grants as well as reimbursement from Medicaid and private insurance. It is just the type of “non-traditional” clinic the Trump Administration has in mind as it rewrites its Title X funding rules. As Bravo often likes to recount, she became anti-choice in the thirty minutes after she had an abortion—walking out of Planned Parenthood, she says, she discovered she had a flat tire and had to wait on AAA. During those moments of reflection on what she’d done, she “started crying and talking to God,” as she told a Catholic news organization in 2016. ... I knew in 2004, that for the pro-life movement to really survive and thrive, the pregnancy center model needed to change; it was becoming outdated and a bit obsolete. So I went to the board of the three Birth Choices and told them that I wanted to take the pregnancy centers into a full medical model that could get patients out of Planned Parenthood and into our clinics. I went into this to give women alternatives to abortion by competing against the organizations I had gone into to have my abortion. By the end of 2006, Bravo says, Birth Choice in California offered prenatal care, ultrasounds, and full STD testing and treatment. Sustained primarily by donations, the organization grew to operate five clinics and a mobile center in the Los Angeles area by 2015. But, limited by the religiously affiliated baggage of the “Birth Choice” branding, the company renamed itself in 2015 as Obria—derived from the Latin word “Obra,” which means “good works.” The company began partnering with primary care physicians around the same time. Three years after Obria’s pivot to neutrality, the Trump administration proposed new rules for Title X funding that encouraged faith-based organizations to apply. 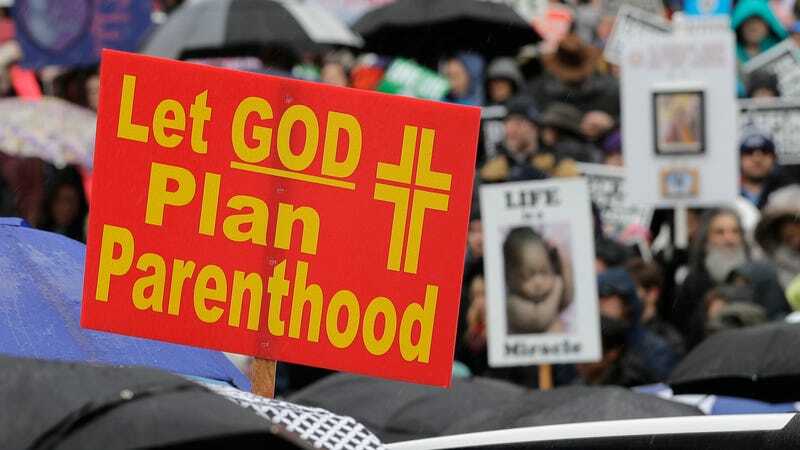 Those rules, which are just now being finalized, would prohibit federal funding for centers that refer people to abortion clinics and encourage participation by “non-traditional” organizations. Like, for instance, clinics that offer fertility awareness as the only form of contraception. Obria was denied federal funding last year because the current rules still require providers to offer hormonal birth control, an issue the clinic told Politico it would circumvent by partnering with other providers. Late last year, Obria launched a $240 million fundraising campaign, much of which was earmarked for brand and affiliate expansion: “With 3,000 stand-alone pregnancy centers currently in the US, uniting under a national brand will help centers move from crisis management to a holistic healthcare model,” the company wrote.